Atlanta combines small-town charm with the hustle and bustle of a big city. The city itself is home to around half a million people, but the Atlanta Metropolitan Statistical Area (MSA) is home to over 5.5 million. It is the ninth-largest metro area in the country. 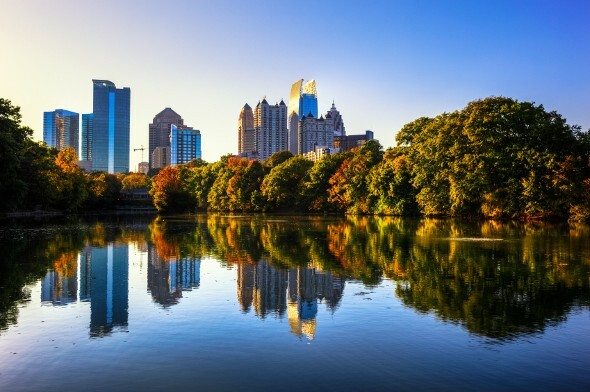 Wondering if Georgia’s capital city is right for you? You probably want to know about the cost of living in Atlanta. According to the Census Bureau, more than 43% of homes are owner-occupied in Atlanta. Homes are relatively expensive, but still much cheaper than other cities, such as Boston or San Diego. Atlanta’s median list price is $330,000 according to Zillow. Median home value is $217,000 which is almost a 10% increase from last year. Not sure if you can afford to buy in Atlanta? You might want to turn to an expert for financial advice. We’ve reviewed the top 10 Atlanta financial advisor firms. It’s not always feasible to buy a home right off the bat. Renting makes sense for many of us. Maybe you’re saving up for a down payment or perhaps you simply enjoy having the freedom to change locations without the burden of selling a home. At any rate, you can expect to pay pretty reasonable rent in Atlanta, but it has increased in the last few years. This could be due to the lower rental vacancy rate for the Atlanta metro area. According to the Census Bureau, the Atlanta MSA had a rental vacancy rate of 9.5% for the first quarter of 2015, but since then, has lowered to around 4%, on par with some of the most populated cities in the U.S. According to numbeo.com, a basic package of utilities for a 915-square foot apartment in Atlanta will cost you $146 (this is a decrease from 2016-2017). That includes electricity, heating, water and garbage. If you want to add internet, expect to pay around the average price of $54. A 30-day pass on MARTA, the Metropolitan Atlanta Rapid Transit Authority, will cost you $95. Atlanta is a driving town, though, with long commutes and heavy traffic a part of life, particularly for those in the metro area as opposed to the city center. According to the Tax Foundation, Georgia has the 17th highest gas taxes in the U.S. That means it’s cheaper than many East Coast states, such as Florida and New York, but more expensive than its neighbors, South Carolina and Alabama. Atlanta has a sales tax rate of 8.9% (7% for Dekalb and Fulton Counties with 1.9% additional for Atlanta). Twice a year the state holds a sales tax holiday. The average effective property tax rate in Atlanta’s Fulton County is 1.157%. Fulton County residents’ median property tax payment is $2,756. This is the highest in the state. Residents of the state of Georgia pay a top marginal state income tax rate of 6%. Atlanta has all the tasty treats you’d expect in a Southern city. Popular chains include Waffle House and Chick-Fil-A, but there’s a thriving independent restaurant scene, too. If you want to sample what the city has to offer you can attend the annual Atlanta Food and Wine Festival. A one-day pass will cost you $190. Want a three-day pass? That’ll be $585. According to numbeo.com, a three-course meal for two in a mid-range restaurant will cost you $50. A meal for one at an inexpensive restaurant has an average price of $15. Prefer to cook at home? A pound of chicken breasts will cost you $3.50. A dozen eggs will cost you $2.14. Numbeo’s recommended minimum amount of money for food for one person in Atlanta is $334 per month. To counteract all the Southern delicacies available in Atlanta you may decide a gym membership is worth trying out. If so, expect to pay $35 a month. If you prefer watching sports to exercising, head to Atlanta’s Suntrust Park, opened in March 2017 to see the Atlanta Braves play baseball. Be prepared to spend some of the highest pricest in the U.S. for tickets: According to Barry’s Tickets, the Braves’ average ticket price is $101. It’s the third highest in Major League Baseball, a huge jump from when tickets were $20 for games at Turner Field in 2016. It would be a shame to live in Atlanta without exploring the city’s rich history, right? You certainly have a lot of options and not all of them carry a hefty price tag. A visit to the Martin Luther King, Jr. National Historic Center is completely free. Admission to Atlanta’s Jimmy Carter Presidential Library and Museum is free for anyone 16 and under. It costs $8 for adults. An adult ticket to Atlanta’s Center for Civil and Human Rights will cost you around $18, childrens’ tickets are $14. You can also buy the Atlanta CityPASS. The $75 (plus tax) pass for those 13 and over gets you admission to five Atlanta attractions. They include the Center for Civil and Human Rights or the Atlanta Zoo, the Georgia Aquarium, the World of Coca-Cola, the Inside CNN Studio Tour and the Fernbank Museum of Natural History or the College Football Hall of Fame. The Atlanta CityPASS for children 3-12 costs $59 plus tax. For a totally free outing you can always head to the BeltLine, an Atlanta project that will grow to comprise 33 miles of multi-use trails converted from an elevated rail track. The BeltLine began as a graduate student’s idea in 1999 and opened its first sections in 2005. That’s right – Atlanta had a “high line” before New York City did. If you’re preparing to move to Atlanta, it can be helpful to know how the change will affect your budget so you can plan accordingly. A financial advisor can help you navigate big life changes like a cross-country move, or just help you to meet your financial goals in general. A matching tool like SmartAsset’s can help you find a person to work with to meet your needs. First you’ll answer a series of questions about your situation and your goals. Then the program will narrow down your options to up to three financial advisors who suit your needs. You can then read their profiles to learn more about them, interview them on the phone or in person and choose who to work with in the future. This allows you to find a good fit while the program does much of the hard work for you. If you’ll be switching jobs once you move, your paycheck could end up looking quite different than it does now. Try using our Georgia paycheck calculator to estimate what your new take-home pay will be.